This basket contains an abundance of quality fruit. 30+ pieces of fresh fruit (well over 15 lbs. worth), tastefully arranged and delivered with care. Contains an array of pears, apples, oranges, grapefruit, kiwi, bananas and at least two pounds of grapes. We don't skimp on the grapes!!! We will also provide seasonal fruit when available including peaches, plums, strawberries, etc. Exotic fruits are available upon request. 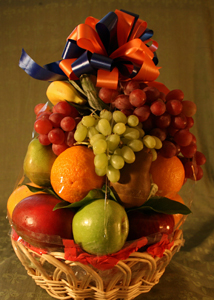 We can customize a basket containing all fruit to any price range starting at $30.